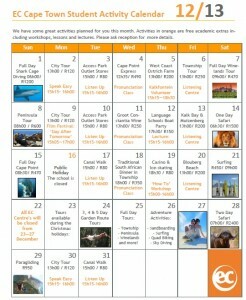 Here is our schedule for this December with great activities every week! *Please remember that the school will be closed for one week during Christmas – from 23 December until 27 December – and we will reopen on Monday 30th December. Grateful for the opportunity at EC Cape Town! Are you ready for an exam course @ EC Cape Town?